How Will a Sunroom Enhance Your Property in Bluffton, SC? In Bluffton, South Carolina, we’re fortunate to enjoy sunshine and beautiful weather for most of the year. It’s the perfect place for those who love the outdoors. However, spending time on a porch or patio isn’t without its downsides. For example, you may be getting tired of retreating from the intense sun into the air-conditioned comfort of your home or having to plan outdoor get-togethers with friends around the weather forecast. Fortunately, there’s a solution. Adding a sunroom is the perfect option for those who love the outdoors but don’t want to deal with pesky insects, inclement weather, or harsh UV rays. Sunrooms bring the outdoors in. They have glass walls, so the space gets completely flooded with natural light. However, because it is enclosed, you’ll be able to keep your sunroom comfortable all year long – even during the scorching summer months. In fact, having a sunroom installed is like adding a new living space to your home. Use it to enjoy meals with family and friends or to relax with a good book. You can even transform the space into a yoga studio, gym, home office, or anything else you can imagine. 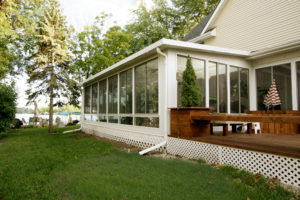 And, if you ever decide to sell your home, your sunroom may significantly increase its resale value. For more than three decades, homeowners have trusted Porch Outfitters to install their sunrooms. We’re proud to install TEMO products, which offer industry-leading durability, thermal efficiency, and beauty. We also only have our own team of highly trained technicians – not subcontractors – handle our sunroom projects, ensuring quality workmanship. For our commitment to customer satisfaction, we’ve earned numerous awards and accolades, including a Best of Bluffton Home Improvement Contractor designation from Bluffton Today. Contact Porch Outfitters today to learn more.